Posted on March 9, 2012 March 12, 2012 by Debito Arudou Ph.D.
Hi Blog. Good news. Congratulations to The Don for getting his Japanese citizenship, and on what looks to be an expedited schedule (of only four months, according to the Yomiuri below. Of course; the guy is in his ninetieth year!) I think it’s good that an old man can realize his twilight dreams, and take advantage of opportunities that he has clearly earned as a contributor to Japan in the world. Well, if you really said this as reported (and you certainly seem to have done so in the past), then screw you, Donald. As I’ve said before here and here, not only are you buying into this whole J media-generated gaijin-bashing “Flyjin” phenomenon (in ways unbecoming a bona fide academic researcher), but your making yourself out to be more holier-than-thou than other foreigners is childish, pandering, and disrespectful of other people making their own life choices. Here’s the Yomiuri’s take, with The Don not only bashing NJ and coming here for the sake of “enduring hardships with the Japanese”, but also traipsing off to Africa and India next month, like most Japanese can to escape their hardships. Donald Keene speaks to The Yomiuri Shimbun in Tokyo on Thursday morning after learning he has been granted Japanese citizenship. Donald Keene, a prominent scholar of Japanese literature and culture, has been granted Japanese citizenship, the Justice Ministry announced in a government gazette issued Thursday. Keene, 89, decided to permanently live in Japan following the Great East Japan Earthquake. A professor emeritus at Columbia University, Keene studied Japanese literature and culture after serving as an interpreter for U.S. forces during the Pacific War. Regarded as an authority in the field, he received the Order of Culture in 2008. He expressed his intention to obtain Japanese citizenship after the March 11 disaster. “I love Japan,” Keene said, while explaining his decision to move to Japan at a press conference following his last lecture at Columbia University. He now lives in Tokyo. Keene expressed his joy over the news that he has been granted the Japanese citizenship in an exclusive interview with The Yomiuri Shimbun at his home in Tokyo on Thursday. “I’m so glad to finally be able to become Japanese,” a smiling Keene said. Right after the March 11 disaster, Keene saw the stoic suffering of people in the Tohoku region on TV. Worried over the news that an increasing number of foreigners were leaving the country, Keene made up his mind to permanently live in Japan. “I wanted to endure the hardships with the Japanese, who had taken good care of me, at a difficult time like this,” he said. Keene applied for Japanese citizenship in November last year. In the end, he obtained his citizenship in only about four months. “Donald Keene” became his pen name, and his Japanese name is now Kiin Donarudo. Starting next month, he will travel by ship to India and Africa for vacation. “[After returning to Japan], I’ll continue to work more diligently in a suitably Japanese way. I also want to contribute to areas affected by the disaster,” he said with a smile. Why is one person (scholar as he is) becoming a citizen such a big story? It illustrates to me how often it does not happen. Special rules for “special people”. Its amusing watching this fool. I should use fool carefully as we once all rode the wave of euphoria that our Donald is now riding, but I find it kind of amusing observing how naive this guy is. Nobody knows he is Japanese, I guess he thinks hell just blend right in and be a Japanese. Once he starts hearing “gaijin” at least once a week everywhere he goes, that big smile will soon be gone. Then hell change that tune Im sure. — Somehow I doubt it. He’s lived an exceptional life here in Japan, probably largely insulated over the past several decades from the lifestyles that would incur him dealing with being called “gaijin” on a regular basis. I would be surprised in his circles and public appearances if he ever hears it again. Good for him, of course. We should all be so lucky. And, again, to return to my point, he should have some awareness of how lucky he is and not publicly denigrate others who aren’t. It just makes a mockery of the whole points system, doesn’t it. Japan is seeking to attract 2000 skilled professionals, and some old fools, apparently. Only four months, AND he was informed by a phone-call! How can the rules bend for him? I thought Japan was ‘a country of law!’. All animals are equal. Some animals are more equal than others. The conclusion he seeks to make is if one believes in Japan, then one seeks citizenship. That raises the whole question: what does it mean when he says: “I believe in Japan”? Does it mean that he accepts and celebrates a country that does not provide for human rights for all? Does he accept and celebrate a country that has no prohibitions on racism? Does he accept and celebrate a country that fails to truly acknowledge its complicity in war crimes during World War 2? For a Japanese mother who lost a child, is she supposed to feel less grief because he became a citizen? The whole notion seems truly bisarre. He should have been either silent or simply stated that he became a citizen because he felt himself to be a permanent part of Japanese society and wanted to ratify that legally. But his point that he believes in Japan, and that he might bring joy to Japanese is odd. 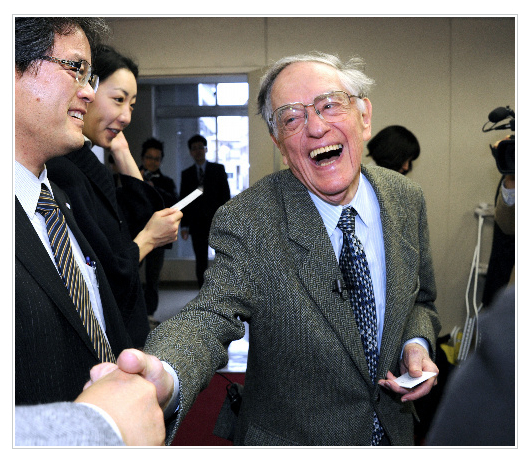 Donald Keene, a world-renowned expert in Japanese literature and a professor emeritus at Columbia University, on Thursday announced that he has obtained Japanese citizenship at Tokyo’s Kita Ward Office. Keen, [sic] 89, said he decided to move permanently to Japan and apply for Japanese nationality after he saw the destruction caused by the tsunami in the Tohoku region last March 11 and heard that many foreigners left Japan afterwards, NTV reported. He said he was moved by the resilient spirit of the Japanese in a traumatic situation and strongly sensed that he would like to live in Japan for the rest of his life. Keene, who relocated to Japan last September, also introduced his name in kanji, 鬼怒鳴門 which is the phonetic equivalent of his name “Keene Donald.” The characters for 鬼怒 are derived from Kinugawa River and 鳴門 from Naruto City in Shikoku. “I would like to play with words. I guess 怒鬼 literally means ‘an angry ogre,’ but that doesn’t match my personality. You guys decide if it’s a good name,” he said. Prominent literature scholar and Japan expert Donald Keene has been granted Japanese citizenship, according to the government gazette issued Thursday. Keene, 89, professor emeritus at Columbia University in New York, was awarded the Japanese Order of Culture in 2008. Since Keene was already spending half of each year in Japan, he decided around January 2011 to live in Japan full time, partly because travel had become physically demanding. But sources reportedly indicated the March 11 calamity distressed him and intensified his desire to make Japan home. He arrived in September. Debito, I take your point, but I still don’t feel comfortable bashing a nearly 90 year old man. I think he is aware of the gaijin slur, I saw some commentary by him when he was getting interviewed, something about “Im a ninjin not gaijin” but I agree, with his elite status, Im sure he will be refered to only as Keene san or Sensei, even by extreme rightist, and all the while loving every minute of it, thus the urge to naturalize. . “But sources reportedly indicated the March 11 calamity distressed him and intensified his desire to make Japan home. He arrived in September.” I dont think so. Also, I see praise for his service in WW2, but I find that naive as well A translator? So it means he was shielded, once again, from all the horrors that the Imperialist had to offer, and was probably japan washed during that time as well. Learning his splendid Nihongo, and seeing only the Japan they want you to see. This guy isnt that deep, and nobody is bashing a 90 years old man. Its commentary on his behavior and the logic behind it. What’s age got to do with it? On the basis of age, should we stop trying to track Nazi war criminals (poor old codgers now, surely)? You can see it as ‘bashing’ if you want to, and if it makes you uncomfortable, then stay out of it, but I think that age is irrelevant, and I don’t see it as bashing. Keene has been slamming NJ who took off after Fukushima. Who the hell does he think he is? We can all come and go anytime we want. I didn’t notice any Faustian contracts with the devil to stay in Japan ‘come hell or high water’, when I got my visa, did you? I like the way Keene talks in the articles about wanting to ‘be with’ the Japanese people, and ‘bring joy’ to the japanese people, and how ‘travel is physically demanding for him’, and what’s the first thing he does with his ‘super fast track, personal service’ citizenship? Yes, take a lengthy cruise to Africa and India! Keene said ‘I wanted to endure the hardships’. Really? When is he going to start doing that then? Patronizing the disaster victims, and then going on holiday, nice. I too doubt that Keene has ever had anyone sit next to him on the train and say ‘gaijin kusai’, but I find it strange that someone who did de-coding for the US military in the war is so blind to the reality of the Japanese. It makes me question if he isn’t driven in part by a sense of guilt at his role in the US victory in the war (kind of like survivors guilt). good point @ Jim di Griz but what I think it is that he wasnt never really exposed to the horrors of the brainwashing of that regime. He, like others, saw something that impressed him, and disqualified the rest. There is still much of this going on today, and Japan is good at administrating this insanity. Perhaps Im wrong, but I think there is a good posiblity that Keene is also a “victim” of this. many who served in the US military (self included) see only a very narrow scope of what any country, Japan included is really like, unless you were a Marine in Iwo Jima etc. I feel Debito is spot on for bringing attention to this. It is quite weird that this guy is “standing with Japan” by naturalizing. He could of done like allot of us, came here young, done the time, have a solid understanding only gained through boots on the ground experiences and even more admirable, like debito san, try to bring attention to it. It is a load of crap, and quite weird, but the Japan apologist are surely doing backflips about it. I think the obvious problem with Keene’s recent rantings is that he is no longer in full possession of his mental faculties. While he has made immense contributions to Japanese literature and was once a fine translator, he should have receded from public view a long time ago in order to preserve his former dignity. About three years ago I attended one of his last public talks at a museum in Tokyo and, frankly speaking, the whole thing was pathetic and he really looked a pitiful sight, drowsily mumbling all those worn-out, embarrassing 日本人論 cliches that only Japan ingenues, reactionary toadies and bowing old ladies in their kimonos still seem to buy. Let’s face it: the man has gone completely gaga, so how can anyone take him seriously? But what disgusted me then – and what disgusts me now in all this media hype surrounding Citizen Keene – is the lengths to which Japanese reactionaries (i.e. the powers that be, incl. most media) continue to go to promote this idyllic, fake image of Japan based on simplistic dichotomies and the demonisation of outsiders. They have no qualms whatsoever about encouraging and exploiting even the senile rantings of an old man, provided that he tells them what they want to hear. As Debito said recently, the way these old farts are lionised and proliferate like mould in Japan speaks volumes of the new rock bottom to which the country is rapidly sinking. If we manage to reach Keene’s respectable age, most of us will probably be as cranky and conservative and decrepit, but hopefully those who take care of us will have the good sense of advising us better and keeping us discreetly away from public view and from ruthless opportunists. I am not bothered with his naïveté in J-media propaganda and scare-mongering tactics against NJ. However, I do have a problem with his cluelessness about what grants him an exclusive social status. His scholarships that directly match the interests of mainstream culture in Japanese society is the reason why he was able to win the popularity from J-media and seal of approval from the authorities. Just because he was teaching at the elite school doesn’t necessarily make him a perfect human being. Nor does it convince me that his achievement outclasses any scholars across the disciplines. Does he outshine any key leading critical scholars including Noam Chomsky (Linguistics), Katherine Hall Jamieson (Public Policy/Communication), Chalmer Johnson (Political Science/Japan Studies), Laura Heins (Asian History/Japan Studies), Robert Putnam (Public Policy/Government), Michael Schudson (Mass Media/Journalism),Bob McChestney (Mass Media/Journalism), Robert Newman (Communication), Sanford Levinson (Law), or Jeffrey Stone (Law)? It’s unrealistic to expect that these scholars would receive as much privilege as Keene did (Ok, Chalmer may be an exception), although many of them may share a positive view toward Japan. But one thing is clear. All of these scholars have successfully earned a high reputation nationwide. It is their outstanding skill sets in analyzing the social problems and addressing the key issues from various perspectives that have brought them to where they are now. And none of them has ever turned a blind eye on social injustice upon human rights or free speech whether it’s in the US or international community because that is their job. It’s obvious that these folks have what Keene doesn’t. Wonder if we will be able to see his name in the list. Seems like the Japanese government has a predisposition towards making high-profile cases of Caucasians becoming “Instant Japanese Citizen” or “Instant Permanent Resident.” A previous example was the American military deserter and dishonorably discharged convict, Charles Jenkins, who the Japanese government helped escape from North Korea. The GoJ claimed his status of “Spouse of a Japanese Citizen” to give him immediate entry and a two-week-processing quickie permanent residence status. Any South Asians or Sub-Saharan Africans been given any similar treatment in Japan? Or, is the racist slant only in favor of Caucasoid European-descent people? Honestly, anybody has the right to criticise anyone whose views and assertions they don’t agree with. Interesting news about Keene from the perspective of how privileged old white men in their dotage are fast-tracked to Japanese citizenship – it just looks kind of ridiculous. And it is. Keene is mostly irrelevant these days, like so much is with the realities of the huge generation gaps and focus of most people on only limited areas of interest because of the all-powerful net and social networking etc. Most non-American university students and graduates have no idea who is, even those who study Japanese or have studied the language or culture at some point. Most non-Americans, interested in Japan or not, have no idea who he is. Keene belongs to a long departed generation, and his views hold little relevance because they belong to American generations which were brought up on ideas of academic relevance which have now gone. Donald who? is the question that comes up. I’ve read his stuff some time ago and it never struck me as being that notworthy. Too much bias and cliche for those with an analytical mind that understand Japan is only relevant to the wider world because of its intense modernisation in the 19th and 20th century based on western technology and development, as well as colonialism which Japan aped in its most crude and vicious kind rather than learning from other aspects. Donald who? If he’s lucky 1 percent of Americans know who he is, less elsewhere. The ‘news’ about his going to India etc on a boat trip is unintentionally funny – he loves Japan so much that he can’t wait to get out of the country. Anywhere else he’d simply be a rich, senile man. Keene reminds me of some of the goofs I have had the great privilige of working for/with in Japan. Shielded from all the hells that we local hires put up with, but somehow becoming a leading expert on all things Japan. The Japanese play with them like a toy, and the fool mistakes it for something genuine. I must say Japanese are masters at this, Ive walked away from meetings and encounters scratching my head, realizing I had just been taken for a ride. They are good, damn good. Where/how this comes from, well perhaps there is a book about it. Unlike the naive goof I once was, I can now recongnize it, but I am not good at doing it. I was motivated to comment here because someone upthread called Donald Keene a “fool”. Keene has done more than any other person, with the exception of Donald Richie (whose ironic, irreverent attitudes might upset some commenters in this thread), to promote Japan and Japanese culture to the world. He’s a figure of historical proportions, and deserves respect and understanding. Yeah, he said some off-the-cuff remarks about “Flyjins”, but, in the grand scheme of things, his other monumental accomplishments far outweigh whatever perceived slights he mentioned in the terrifying days following the triple disaster. Could it be that you were just treated like crap by your employer, and you were bitter that somebody else had a better deal? Yes, that sounds par for the course for Japanese employers. I gotta say, having studied under Donald Keene for several years, I think you are 300% off the mark here. He’s quite in touch with the struggles of a lot of NJ, particularly in the field. He tells stories of being disrespected, openly plagiarized, and excluded. He recognizes that the respect he has is a function of his age and his accomplishments, and realizes that a lot of things are still left to be done. At least that’s what he’s said to me. — Not how it appears by what he’s said in public. Repeatedly. Danny, could you share some of those stories about Dr. Keene being plagiarized and disrespected? Was this by other non-Japanese scholars? In what way did people disrespect him? Just curious. He never went into specifics on that front, but he spoke (more than once) of having his work lifted by Japanese scholars a number of times, who essentially thought they could get away with it because they would have more credibility due to their being Japanese. The notion that he hasn’t had to fight for his position in Japanese society to me seems kind of ludicrous – it’s not as if Japanese society was more open to foreigners back in Showa than it is now; and even with his reputation, he used to joke about how when he was giving a lecture in Japanese the audience would all simultaneously gasp if he wrote something in kanji on the board. At least as far as scholarship is concerned, he made it clear to us (non-Japanese PhD students in Japanese literature) on several occasions that, even though things were better than they were 50 years ago, getting accepted as scholars in Japanese academia was not going to be an easy road. He’s worked hard over his life and he’s earned what he’s gotten, and, having known him personally, I’m more inclined to give him the benefit of the doubt. — If you’re inclined to believe that he didn’t actually mean what he’s said in public, that’s your choice. To me, it seems a rum choice of his to denigrate others now if he, as you attest, understands the feeling of being denigrated so deeply. Maybe this ‘selective memory’ that Donald has is a sign that his mind is going, or that he is joining in with the ‘tatemae’, or that he is simply closing the door behind him (I’m alright, it’s the ‘bad gaijin’ who left Japan….’)? I don’t think that he didn’t mean what he said in public, I just don’t think that he made the statement with a conscious effort to denigrate others or that he wanted to make himself out to be somehow morally superior to other lowly foreigners who left Japan. Because, whether or not the media opted to inflate the issue out of proportion, the fact is that a lot of people did choose to leave Japan after the earthquake – American companies recalled people stationed in Japan, at my university in Kyoto I knew PhD students who went home, and one of the study abroad programs that we host ended their program early and shipped their students back home. And, in a way, understandably so – a lot of people were worried about what was happening in Fukushima, and if you’re in a disaster zone, it makes a lot of sense to get to somewhere safe. Hell, my wife (born and raised in the now uninhabitable part of Fukushima) tried to convince me to take her and the kids to stay with my parents in New York, which I refused to do, but if radiation had been headed towards Kansai in considerable amounts, I might have considered it – because at the end of the day, the health and safety of my family takes priority over pretty much everything else. And, of course, a lot of people – probably the majority of people (myself included) – didn’t leave for a lot of different reasons. Yes, it got annoying to get asked if I was going to leave every 10 minutes, and I quickly grew tired of the news coverage about how everyone was leaving and wished they would talk to everyone who was staying (like the JETs in Miyagi etc.) but they didn’t just make that up out of whole cloth – a lot of people were actually leaving, and it’s perfectly reasonable to assume that Prof. Keene knew people who left and felt a sense of obligation to go (which was partially bolstered by the fact that he had just retired from Columbia and, pushing 90, was likely sick of spending 6 months of every year in Japan and 6 months in the US and was looking to settle in one or the other anyway). I really just don’t think that this was a statement made out of some sort of attempt to promote his own supposed moral superiority, and more out of a desire to express personal sentiment that was bolstered by both first-hand and anecdotal evidence. — Then Keene is in fact, in this regard, a poor researcher. He bought into the media-generated “flyjin” anti-gaijin panic despite all the poor social science involved. As have you, it would seem. A lot of (far less reported) Japanese left too because, as you say, “if you’re in a disaster zone, it makes a lot of sense to get to somewhere safe”, and if you too had left, for whatever reason, you would be lumped in with the group Keene has been repeatedly denigrating. And where’s the denigration for Japanese who left, and who left (taking Thai workers with them) during Thailand’s floods last October instead of staying behind “in solidarity”? In any case, the “flyjin” phenomenon is a myth. If one actually does some research and looks at the registered NJ statistics for 2011, the largest group by percentage and raw numbers to leave were the Brazilians, again, and that has little to do with Fukushima (since the 8% drop per year has happened unabated for the third year in a row, and most Brazilians are clustered nowhere near Touhoku). I wouldn’t try so hard just out of personal loyalty to hitch your wagon to Keene, as you have no control over his actions and you risk sounding just as blinkered and ignorant as he does.